Quick screenshot of the download part of the results section of a webform. Notice the options here. THis makes it a good choice for surveys too. 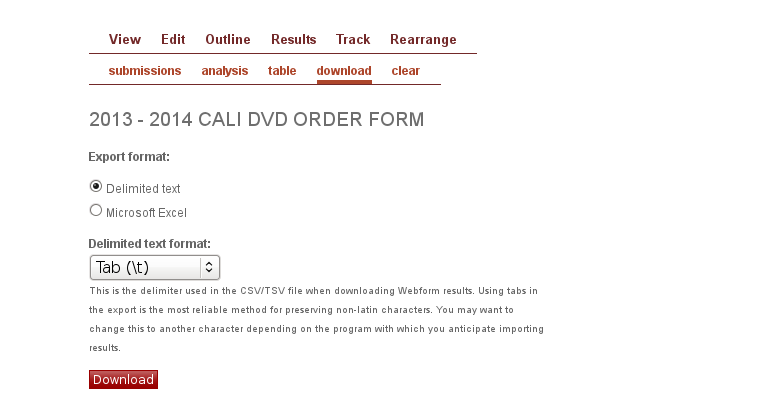 USing the Drupal Webform module to create an order form for the 2013-14 DVD. I had forgotten how well this module works. IT does what it says it does with a minuimum of fuss. If you need a simple form to get some info from vivsitors, you can’t beat it. Working now on processing these to get the topics into teh metadata of the cases. Then feeding to Solr. Back into cases. I have a spreadsheet that assigns a CALI Topic(s) (Torts, Property, Civ Pro, Contracts, Crim Law, Crim Pro) to each of several thousand cases. The high level topic selection is based on common knowledge and use in legal education. Next trick is take the spreadsheet, get it into a db and match the topics to existing cases (in HTML already) and then generate lists of cases by CALI Topic. It seems like the widget is not seeing the projects on Do.com. This can lead to errors like duplicate projects. I need to look into this. Looking into doing something like forwarding webmaster email to Do as a way to provide some tracking on things.